Inspire Australia’s next Cadbury Favourites Christmas TV commercial! 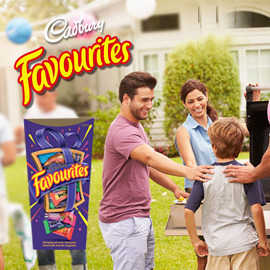 In 2011, Cadbury created one of Australia’s most loved TV commercials for its Favourites brand. Cadbury Favourites is a box full of miniature versions of Cadburys bestselling chocolates, including Cadbury Crunchie bar, Cadbury Flake, and Turkish Delight amongst many others. We want you to create the storyline for the next version of this TVC. This time around the TVC needs to have specific relevance to the social gatherings that can take place at the end of the year, in the lead up to Christmas, where Australians celebrate the year that’s passed and re-connect with friends and family they haven’t seen for a while. Can you keep what makes the Cadbury Favourites TVC great to watch, while injecting a new dose of creativity and fun with a new story for the Christmas period? Format: Presentation with texts and at least 1 visual illustration (maximum 4 PDF page). Save their day with this brief!